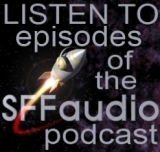 Jerry Stearns of Great Northern Audio Theatre and the long running radio drama showcase Sound Affects: A Radio Playground, has planned out an compelling Science Fiction and Fantasy audio drama plan for the coming quarter. Aug. 23 – Ruby: Tired of the Green Menace – the FIRST Ruby show from ZBS (she’s still called Ruby Tuesday). Sept. 6, 13, 20 – Anne Manx and the Empress Blair Project – the latest from Radio Repertory Company of America, with Claudia Christian. Sound Affects: A Radio Playground airs Sundays in at 9:30 PM on KFAI, 90.3 FM and 106.7 FM, Minneapolis and St. Paul. Online streaming is available at KFAI.org. The first episode on the schedule is the 2009 Mark Time Awards show, titled Jokes In Space, it was recorded at Convergence 2009. It is available as an |MP3|. Am I the only one who’d kill for a regular Sound Affects podcast feed?